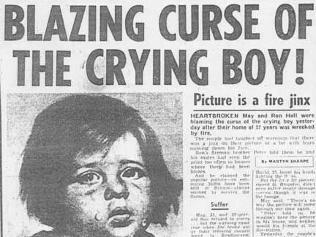 It came from the same tabloid headline factory that produced ‘Freddie Starr Ate My Hamster‘ – and the Curse of the Crying boy continues to live online. I will presenting a paper on this quintessential urban legend at the Folklore Society Conference & AGM 2013 at The School of Welsh, Cardiff University, weekend of 19-21 April 2013. The conference theme is ‘urban folklore’ and my talk will be based upon the contents of my chapter in Bob Bartholomew and Ben Radford’s recent book The Martians Have Landed: A History of Media-Driven Panics and Hoaxes (Jefferson, North Carolina: McFarland, 2012). 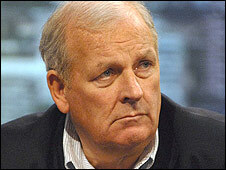 But for the uninitiated, here’s a summary: In 1985 a British tabloid newspaper, The Sun, edited by Kelvin McKenzie, published a report of a fire that badly damaged a terraced house in a South Yorkshire mining community. In each case the kitsch prints – attributed to a mysterious Spanish artist known as Bragolin – were left untouched by the devastation around them. Belief in the potency of the cursed painting began life as a ‘silly season’ story but within a decade it had developed a coherent narrative. The arrival of the internet allowed the story to reach a wider audience where it merged with other legends concerning haunted artwork. Almost three decades later it continues to titillate and terrify readers around the world. My presentation in Cardiff will examine the origins of this urban legend and the role played by the mass media and tabloid journalists in its dissemination and evolution. Read my Fortean Times article on the legend for more details. This entry was posted in Uncategorized and tagged Benjamin Radford, Bragolin painting, Cardiff University, crying boy, curse, curse of the crying boy, Folklore Society, Freddie Starr ate my hamster, Kelvin McKenzie, Robert Bartholomew, School of Welsh, Silly Season, The Martians Have Landed!, The Sun, urban legends. Bookmark the permalink.